It’s finally happening! Here’s the Picr roll-out master plan. It’s been a year and half since we started building Picr. During this time, we briefly experimented with a marketplace platform but quickly realized that a more fundamental problem must first be addressed: photography business management. We have written about this pivot previously, and since then, we’ve refocused all of our energy, time, and finances into re-envisioning what a photography business platform could, and should be. Many of you shared with us how difficult it is to manage a photography business, especially the challenges revolving around managing project tasks and finding new clients. Currently, there is no platform that is able to bring your entire business into one place, giving you a good handle on the big picture of your entire business. 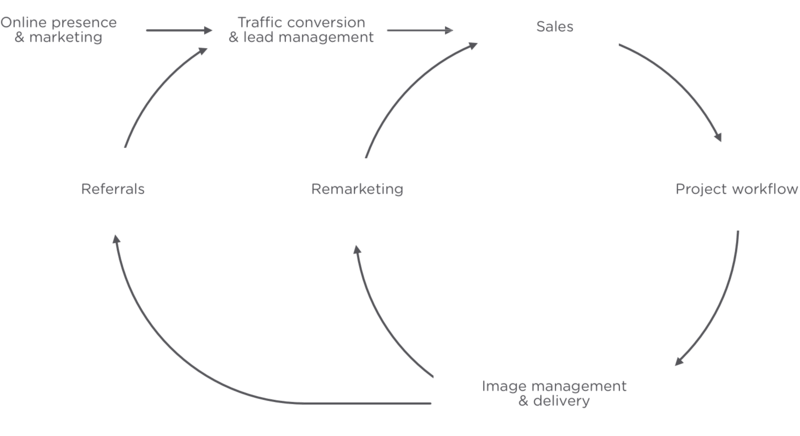 After conducting thorough research and speaking to many of you, we noticed a basic business cycle, present in every photography business. The clearer you understand each component, and the better tools you have to wield, the more effectively you can grow your business. We are building Picr so that your photography business could be manageable and profitable. This cycle is nearly impossible to manage if you are having to re-enter all of your data across many platforms. You simply lose track of who said what, and when, and what exactly you’re supposed to do next. You miss your deadlines, appointments, and worst of all, many opportunities to understand, grow, and profit your business. Even still, you won’t have a real dashboard, nor an app which could deliver all of your important updates on-the-go. Our goal at Picr is to solve this for you. These tools exist for many industries, why can’t they also exist for photographers? By bringing all of the essential components under one roof, we are able to significantly bring down the cost and dramatically simplify your business management hassle. Picr is currently 90% complete, and we’re eagerly excited to show it to you. We believe that we have solved many difficult issues in creative new ways. Much attention has been given to central issues around user experience (UX) and design (UI); ensuring that the platform simple, intuitive, and beautiful. Right now, we are eagerly preparing to onboard our first alpha test group. Interested in participating? Apply here by December 10th. We are looking for a small US-based group of experienced, preferably full-time photographers, to join our first test group. You will run your business using Picr and give us regular feedback about what works and what needs attention. On our side, we will be carefully listening to you and efficiently improving critical features. We will launch Picr Beta as soon as our alpha group is satisfied. In the meantime, our team will continue to make sure that we are listening to you and making all of the right improvements. Should you ever work for FREE? Picr Product Reveal: What and When is Picr? The Startup Story of Picr. From the Beginning. Will Picr Meet Your Expectations? Sign up for inspiring stories, trends, and moments delivered weekly.